The most visible accomplishment of the 2009 bond issue is the reinvention of Mustang High School. Voters overwhelming approved the bond issue with more than 80 percent yes votes. The project was completed in three phases. Students continued attending classes on the campus during construction. The renovated campus officially opened in 2012. Mustang High School was originally the entire school site for Mustang Public Schools, housing grades kindergarten through 12th grade. Before the bond issue was passed, even grades nine through 12 were becoming too large to be housed on the campus. The freshman were then moved next door to the old middle school, renamed Mustang Mid-High, to alleviate overcrowding at MHS. Although the move was necessary, and utilized resources the district already had, instructional time was continually lost as the freshman were bused to the high school for speciality classes. Before the construction and remodeling, Mustang High School was a collection of more than 15 different buildings. Through August heat, freezing winter weather and spring storms, students made their way outside from building to building. The configuration also made securing the campus difficult. Buildings had to be left open for students to enter. Completed in three phases, MA+ Architecture and Timberlake Construction remodeled approximately 91,000 square feet of existing facilities and added 79,000 square feet in additional classrooms, a new administrative area and a new cafeteria. The open area in front of the auditorium was enclosed to become the commons. With seven lunch lines, the area can accommodate all 2,800 students in three lunches. The main classroom buildings were all connected under one roof, making it possible to secure the majority of the campus. 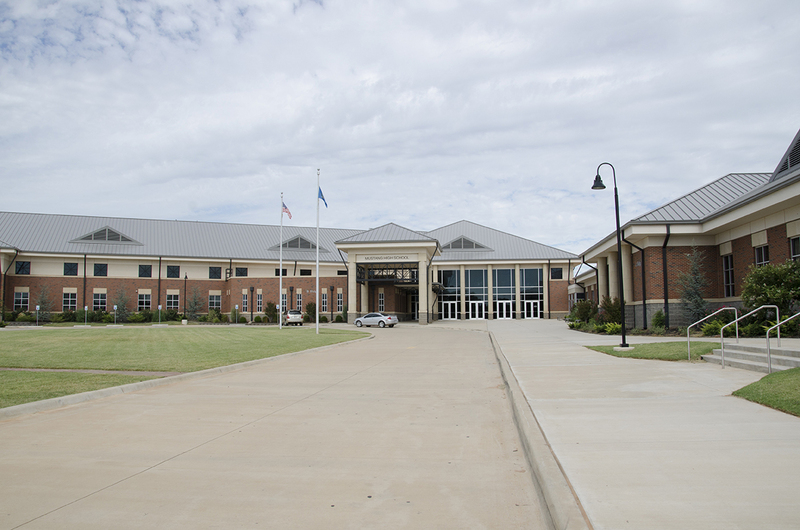 Also, an additional 41,000 square foot building was added in phase three, creating a freshman academy. The district's ninth graders were moved back to campus, but had their own building and their own lunch period. The football stadium was also renovated, taking it from a Class 3A facility to a 6A. Instead of fans staring into the sun from the east side of the stadium, new stadium seating was constructed on the west side.